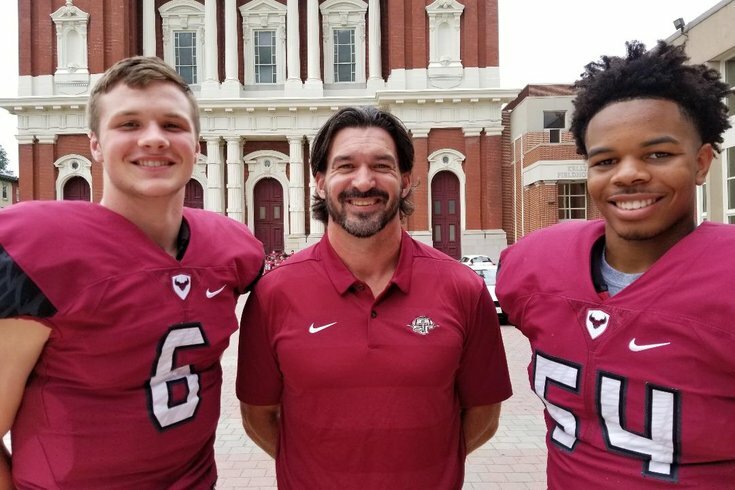 St. Joe's Prep sophomore quarterback Kyle McCord, head coach Gabe Infante, and sophomore linebacker Jeremiah Trotter Jr.
On Sunday evening, the NFL Foundation announced that St. Joe's Prep head coach Gabe Infante, who helped lead his team to four of the last six state football titles, including the 2018 PIAA 6A title this past season, has been named the 2018 Don Shula NFL High School Coach of the Year. Infante, 45, who has been nominated once before in the past, was chosen over 31 other high school coaches — each NFL team nominates a coach, and Infante was the Philadelphia Eagles' nominee. The winner is selected by an 11-person panel that includes Shula, former United States Secretary of State Condoleezza Rice, and various former players, coaches and executives from across the game. The award, named for the winningest coach in NFL history, was created to honor exemplary high school football coaches for their character and integrity, leadership and dedication to the community, commitment to player health and safety and on-field success. The announcement was made today during the 2019 Pro Bowl presented by Verizon. While Infante's 2018 season was capped off with yet another state title, his offseason has been a bit of a wild ride. Back in December, PhillyVoice broke the news that Infante would be stepping down as head coach at St. Joe's Prep to take the linebacker coach job at Temple University under recently hired Manny Diaz. When Diaz abruptly left to return to Miami and take over for Mark Richt as head coach, Infante was left in limbo for a bit until it was revealed earlier this month that he'd be staying at Temple, this time as the running backs coach, under newly-hired coach Rod Carey. Winning a state title and being honored by the NFL as the best high school coach in the country is certainly one way to go out on top.